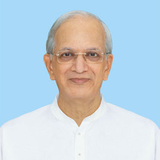 His Holiness Dr Athavale is a former world-renowned clinical hypnotherapist. His transition to fully devoting His life to Spirituality took place when some of His patients were cured by spiritual healing methods. This led Him to explore the field of Spirituality, and He learned of its ubiquitous effect on human life. Intensive spiritual practice under the Guidance of His Guru (His Holiness Bhaktaraj Maharaj) enabled Him to develop a deep understanding of Spirituality. Combining His expertise in clinical hynotherapy with knowledge of Spirituality, He pioneered the Personality Defect Removal Process (PDR), which became the first step in an 8-step method (known as the Path of the Guru's Grace) for faster spiritual progress. Over the past 3 decades, He has conducted hundreds of spiritual research projects and written over 300 Holy texts on various subjects related to Spirituality. Approximately 7 million copies of these Holy texts have been sold in 15 languages. He founded the Maharshi University of Spirituality to teach the14 Vidyas (Sciences) and 64 Kalas (Art-forms) from a spiritual perspective and to help humanity gain access to spiritual practice methods for faster spiritual progress. Jayant Athavale updated their profile information. Jayant Athavale changed their profile image.